Despite being barred from distribution, The Bedan Roar circulated its second issue online. Citing student demand for the issue, the editorial board uploaded the publication online on April 1 and posted an official statement on their Facebook page explaining the reason the distribution was halted. “The reason for the halt order was because the magazine’s contents allegedly contain material that did not pass the standards of the school and was considered not approved,” The Bedan Roar said in their official Facebook statement. “It has been said to be too critical and too negative for the community of San Beda, which is why publishing and printing it alone has been considered unauthorized,” it said. The statement, which stops short of identifying who barred the release, has been taken down on Facebook as of this writing. “It is our responsibility to tell the truths of any situation,” they said. The Bedan Roar, the official publication of San Beda University-SHS, was stopped by the admin from releasing the second issue of their magazine for being “too critical and too negative for the community of San Beda.”@TBedanRoar released it online instead. Various campus journalism organization expressed their support for the student publication while also sparking calls for press freedom. To think that Duterte even graduated law school in San Beda. But, these… these SHS are not here to play games with everyone. As they say, ang publikasyon ay para sa katotohanan. Walang pinipiling kulay o presidente. You all inspired me a lot. This is a fight, this is ours. Students from the San Beda College Alabang and the College Editors of the Philippines stood with their fellow campus press journalists. Twitter user, Your Lawyer Says, made a thread that explained the roles of the students and the institutions they belonged to in the Campus Journalism Act. “We’re talking about the R.A. 7079 or the Campus Journalism Act. The state policy is clear: a free press even at the campus level. It does not distinguish between private and public educational institutions,” one of the posts in the thread said. In the Campus Journalism Act of 1991, it is stated that the State has “to uphold and protect the freedom of the press even at the campus level,” which includes funding and training programs of the student journalists. Section 3 also specifically explained that the type of articles to be published are only for the editorial board, which comprises students, to decide. There was a case before when the private institution barred the rights of the members of a school paper. A 1994 issue of Miriam College’s Chi-Rho magazine allegedly contained content that was “devoid of all moral values.” Some members were expelled while others were suspended, and the Supreme Court upheld this decision. The High Court reasoned that this is an exception to section 7 of RA 7079 that protects students from suspension or expulsion based on the articles they have written. 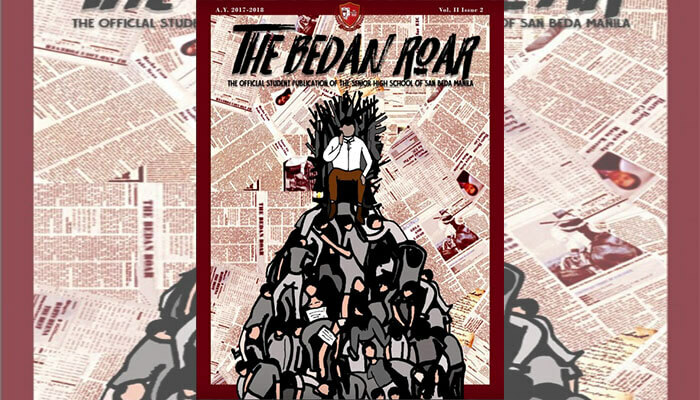 In the current issue of The Bedan Roar, the cover shows a caricature of President Rodrigo Duterte sitting on a throne on top of a pile of bodies.